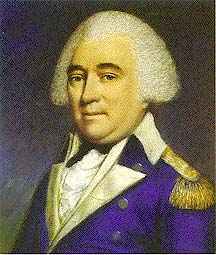 One of the heroic figures of the Revolution was Anthony Wayne, Major-General of the Continental line. With the exception of Washington, and perhaps Greene, he was the best general the Americans developed in the contest; and without exception he showed himself to be the hardest fighter produced on either side. He belongs, as regards this latter characteristic, with the men like Winfield Scott, Phil Kearney, Hancock, and Forrest, who reveled in the danger and the actual shock of arms. Indeed, his eager love of battle, and splendid disregard of peril, have made many writers forget his really great qualities as a general. Soldiers are always prompt to recognize the prime virtue of physical courage, and Wayne’s followers christened their daring commander “Mad Anthony,” in loving allusion to his reckless bravery. It is perfectly true that Wayne had this courage, and that he was a born fighter; otherwise, he never would have been a great commander. A man who lacks the fondness for fighting, the eager desire to punish his adversary, and the willingness to suffer punishment in return, may be a great organizer, like McClellan, but can never become a great general or win great victories. There are, however, plenty of men who, though they possess these fine manly traits, yet lack the head to command an army; but Wayne had not only the heart and the hand but the head likewise. No man could dare as greatly as he did without incurring the risk of an occasional check; but he was an able and bold tactician, a vigilant and cautious leader, well fitted to bear the terrible burden of responsibility which rests upon a commander-in-chief. Of course, at times he had some rather severe lessons. Quite early in his career, just after the battle of the Brandywine, when he was set to watch the enemy, he was surprised at night by the British general Grey, a redoubtable fighter, who attacked him with the bayonet, killed a number of his men, and forced him to fall back some distance from the field of action. This mortifying experience had no effect whatever on Wayne’s courage or self-reliance, but it did give him a valuable lesson in caution. He showed what he had learned by the skill with which, many years later, he conducted the famous campaign in which he overthrew the Northwestern Indians at the Fight of the Fallen Timbers. Wayne’s favorite weapon was the bayonet, and, like Scott he taught his troops, until they were able in the shock of hand-to-hand conflict to overthrow the renowned British infantry, who have always justly prided themselves on their prowess with cold steel. At the battle of Germantown it was Wayne’s troops who, falling on with the bayonet, drove the Hessians and the British light infantry, and only retreated under orders when the attack had failed elsewhere. At Monmouth it was Wayne and his Continentals who first checked the British advance by repulsing the bayonet charge of the guards and grenadiers. Washington, a true leader of men, was prompt to recognize in Wayne a soldier to whom could be intrusted any especially difficult enterprise which called for the exercise alike of intelligence and of cool daring. In the summer of 1780 he was very anxious to capture the British fort at Stony Point, which commanded the Hudson. It was impracticable to attack it by regular siege while the British frigates lay in the river, and the defenses ere so strong that open assault by daylight was equally out of the question. Accordingly Washington suggested to Wayne that he try a night attack. Wayne eagerly caught at the idea. It was exactly the kind of enterprise in which he delighted. The fort was on a rocky promontory, surrounded on three sides by water, and on the fourth by a neck of land, which was for the most part mere morass. It was across this neck of land that any attacking column had to move. The garrison was six hundred strong. To deliver the assault Wayne took nine hundred men. The American army was camped about fourteen miles from Stony Point. One July afternoon Wayne started, and led his troops in single file along the narrow rocky roads, reaching the hills on the mainland near the fort after nightfall. He divided his force into two columns, to advance one along each side of the neck, detaching two companies of North Carolina troops to move in between the two columns and make a false attack. The rest of the force consisted of New Englanders, Pennsylvanians, and Virginians. Each attacking column was divided into three parts, a forlorn hope of twenty men leading, which was followed by an advance guard of one hundred and twenty, and then by the main body. At the time commanding officers still carried spontoons, and other old-time weapons, and Wayne, who himself led the right column, directed its movements spear in hand. It was nearly midnight when the Americans began to press along the causeways toward the fort. Before they were near the walls they were discovered, and the British opened a heavy fire of great guns and musketry, to which the Carolinians, who were advancing between the two columns, responded in their turn, according to orders; but the men in the columns were forbidden to fire. Wayne had warned them that their work must be done with the bayonet, and their muskets were not even loaded. Moreover, so strict was the discipline that no one was allowed to leave the ranks, and when one of the men did so an officer promptly ran him through the body. No sooner had the British opened fire than the charging columns broke into a run, and in a moment the forlorn hopes plunged into the abattis of fallen timber which the British had constructed just without the walls. On the left, the forlorn hope was very roughly handled, no less than seventeen of the twenty men being either killed or wounded, but as the columns came up both burst through the down timber and swarmed up the long, sloping embankments of the fort. The British fought well, cheering loudly as their volley’s rang, but the Americans would not be denied, and pushed silently on to end the contest with the bayonet. A bullet struck Wayne in the head. He fell, but struggled to his feet and forward, two of his officers supporting him. A rumor went among the men that he was dead, but it only impelled them to charge home, more fiercely than ever. With a rush the troops swept to the top of the wall. A fierce but short fight followed in the intense darkness, which was lit only by the flashes from the British muskets. The Americans did not fire, trusting solely to the bayonet. The two columns had kept almost equal pace, and they swept into the fort from opposite sides at the same moment. The three men who first got over the walls were all wounded, but one of them hauled down the British flag. The Americans had the advantage which always comes from delivering an attack that is thrust home. Their muskets were unloaded and they could not hesitate; so, running boldly into close quarters, they fought hand to hand with their foes and speedily overthrew them. For a moment the bayonets flashed and played; then the British lines broke as their assailants thronged against them, and the struggle was over. The Americans had lost a hundred in killed and wounded. Of the British sixty-three had been slain and very many wounded, every one of the dead or disabled having suffered from the bayonet. A curious coincidence was that the number of the dead happened to be exactly equal to the number of Wayne’s men who had been killed in the night attack by the English general, Grey. There was great rejoicing among the Americans over the successful issue of the attack. Wayne speedily recovered from his wound, and in the joy of his victory it weighed but slightly. He had performed a most notable feat. No night attack of the kind was ever delivered with greater boldness, skill, and success. When the Revolutionary War broke out the American armies were composed merely of armed yeomen, stalwart men, of good courage, and fairly proficient in the use of their weapons, but entirely without the training which alone could enable them to withstand the attack of the British regulars in the open, or to deliver an attack themselves. Washington’s victory at Trenton was the first encounter which showed that the Americans were to be feared when they took the offensive. With the exception of the battle of Trenton, and perhaps of Greene’s fight at Eutaw Springs, Wayne’s feat was the most successful illustration of daring and victorious attack by an American army that occurred during the war; and, unlike Greene, who was only able to fight a drawn battle, Wayne’s triumph was complete. At Monmouth he had shown, as he afterward showed against Cornwallis, that his troops could meet the renowned British regulars on even terms in the open. At Stony Point he showed that he could lead them to a triumphant assault with the bayonet against regulars who held a fortified place of strength. No American commander has ever displayed greater energy and daring, a more resolute courage, or readier resource, than the chief of the hard-fighting Revolutionary generals, Mad Anthony Wayne.